We've gotten a lot of requests for reviews of the Green Lantern Movie Masters. Well, better(?) late than never. Back in May, we predicted that the Green Lantern toys would clog shelves for months, and we were sadly proven right. The movie tanked, which did nothing to help move the already-mediocre toys, so the first shipments have languished on shelves and later figures never had a chance. If you wanted those, you had to go online (and you just know how very much we love that option). While most phantom series command prices significantly higher than their more plentiful brothers, that's not really the case with the later waves of GL Movie Masters: the demand is so low that you can get the unreleased ones for very reasonable prices, even once you factor in shipping. I certainly wouldn't have gotten this figure for Christmas if the seller wanted more than retail. Hell, I wouldn't even have asked for this if it weren't so cheap. The only thing the Four Horsemen did on this line was the Parallax BAF, with the rest of the figures coming from digital files. 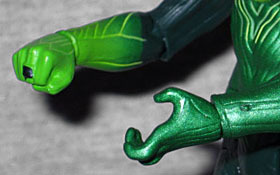 That really shows on this figure's likeness, which has the soft, vague look of an unretouched RealScan output. Sure, it looks Ryan Reynolds-ish, but since one of the high points of the film was pointing out how useless a domino mask is at hiding a recognizable face, it'd be nice if the toy had a recognizable face to (not) hide. The body sculpt is no better. Leaving aside the decision to make the costumes in a big summer movie using the same level of technology seen on SciFi Channel's Sanctuary, the details in the sculpt are nowhere near crisp enough to do the designs justice. The "suit," such as it was, had striations meant to match the musculature beneath, and the toy tries its best to do the same, but it just ends up looking soft. There are also a few sculptural oddities that result from badly designed articulation. Hal has swivel/hinge ankles, knees, elbows and shoulders; swivel wrists, biceps and waist; H-hips; and a balljointed head. And that may sound like a lot, but most of it is terribly made. The elbows and knees barely move to a 45° angle, despite having blatant cut-outs around the joints. The deltoid muscles float away from the body, looking like bulbous mushroom caps on the outside of the actual shoulder joint. You get what they were going for, but it looks stupid and does nothing to improve the range of motion - in fact, it limits it. The right bicep swivel was nearly broken right out of the package, just because of the way it was posed in the tray, but none of the other joints had major problems. On top of all that, the paint is lacking. Warner Brothers spent $9 million on last-minute FX tweaks to make the GL movie look better, which pretty much amounted to making the costumes more sparkly. The figure has pale stripes painted across his chest, though the coverage is sloppy and uneven. His right hand is a different color from his left hand, which may be an attempt to suggest the glow of his ring, but it absolutely doesn't work. Finally, he seems to have painted stubble for absolutely no reason. If that's all there was to this set, I wouldn't have been intereted. But Hal doesn't come with a piece of the (never-going-to-be-completed) Parallax BAF, so there was some extra room to fill in the package. Thus, he comes with a second GL, Bzzd of Sector 2261. 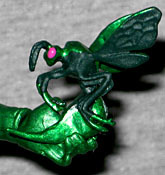 Bzzd is one of the smallest Green Lanterns, even smaller than B'Dg. He's an insect - about the size of a common house fly - and his partner was the largest GL, the living planet Mogo. Bzzd was just one of the many cameos in the film, but in the comics he was instrumental in defeating Mongul. The figure has no articulation, but it would be nice if he had a display stand to allow him to hover, rather than having to lay on the ground all day. 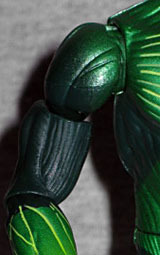 Additionally, the figure comes with a adult-sized Power Ring, and no, it's not one of the cheap ones DC put out. This is a surprisingly high-quality item, with a (non-adjustable) metal band that's textured on the outside, and a plastic GL symbol on top. It's too small to fit on my middle finger, but it seems perfectly sized for my ring finger. If I knew what size my wedding ring was, I'd be able to tell you what size the ring is. Let's say 11, 11½. This isn't an accessory I would have wanted, but it's much nicer than I expected when I saw it in the packaging. Mattel did a monumentally poor job on their Green Lantern toys - there's a reason both the 4" and 6" lines were nominated for Worst of the Year. I got this set because I liked Bzzd, not Hal, and that's a good thing: Hal Jordan is such a god-awful crappy toy, I'd be royally pissed to find out something I actually wanted turned out this poorly.